Games and Decisions: Introduction and Critical Survey. Luce, R. Duncan and Howard Raiffa. New York: John Wiley & Sons, Inc. Publishers, 1957. First edition of this introduction to game theory. Octavo, original half cloth. Inscribed by Howard Raiffa on the title page. Fine in a near fine dust jacket. 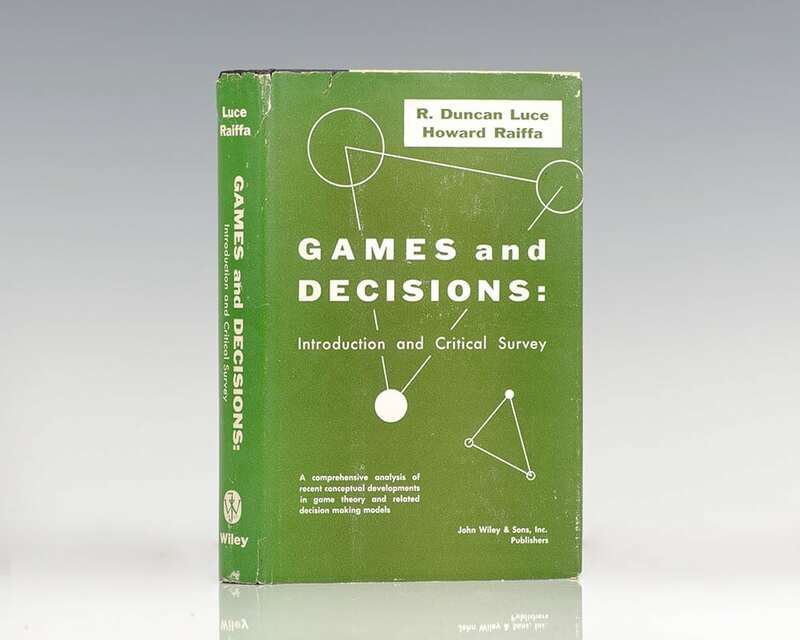 Games and Decisions: Introduction and Critical Survey is a superb non-technical introduction to game theory, primarily applied to social sciences. Clear, comprehensive coverage of utility theory, 2-person zero-sum games, 2-person non-zero-sum games, n-person games, individual and group decision-making.